As my meal planning tends to be somewhat last minute, I love the versatility of this recipe. The veggies allow for easy substitutions based on what's on hand or based on your particular tastes. Our first serving used Guy's method of toasting the quinoa, and our second used leftover quinoa from another recipe. Both worked wonderfully and the second version saved some time, though I will enjoy the toasted when time allows. We've substituted spinach and kale for the greens and changed up the veggies to include asparagus and red pepper in addition to those on Guy's list. Have fun, create, and enjoy! Guys recipe is given from his book, Guy Fieri Food: Cookin' It, Livin' It, Lovin' It , my substitutions are in red. 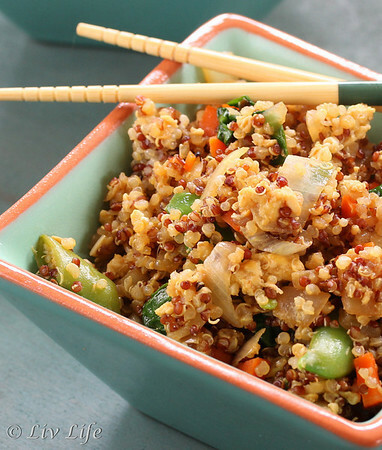 In a large, dry, heavy bottomed skillet, toast the quinoa until lightly golden, 5 to 6 minutes, stirring often. Add the water and reduce the heat to medium. Cover and cook until quinoa opens and the liquid is absorbed, about 20 minutes. Transfer to a bowl to cool. Wipe out the skillet and heat 1 ½ tbs of the olive oil over medium high heat. Add the onions and cook until well browned and soft, about 20 to 30 minutes, stirring occasionally. Stir in the shallots, and cook for 2 minutes, then the garlic, ginger, and green onion, cooking for 3 to 4 minutes more. Add the carrots, bok choy, celery, cabbage, and snap peas and stir until just wilted. Pour in the soy sauce and combine. Transfer mixture to a bowl and cover. Heat remaining oil in skillet over medium-high heat. Add the quinoa. When heated through, pour the eggs over the quinoa until eggs have cooked. Return the vegetables to the pan. Adjust the seasoning with additional soy sauce if needed. It's true that you don't usually gush this much so I'm definitely paying attention. We are quite alike in our lack of frying and love of veggies and grains. :) This dish does look terrific and worth a try. I'm very proud to be quoted on your post. Even though I said crapballs. Didn't you just looooove this dish? We're having it again...today! 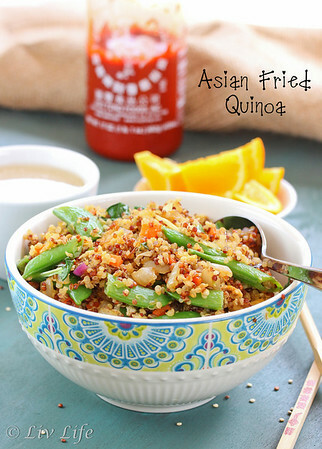 I'm still a little scared of this recipe, mostly because my quinoa always comes out mushy, but after reading all these rave reviews I think I'm going to have to pull on my big girl pants and give it a try anyways. Gorgeous photos, BTW! 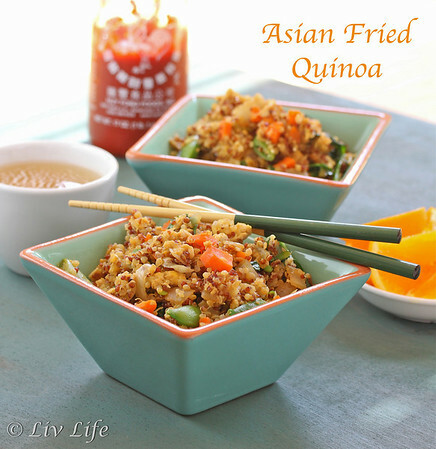 I could go on and on about this Asian Fried Quinoa too- its just perfect. Although I burnt a little - also wondering how did your grain stay so plump? any tips? I am totally convinced that I must make this now. It sounds like the kind of meal that can easily accommodate any vegetables that I happen to have in the fridge, too. This looks like a great combinations of textures, colors and flavors!!! Amazing! I would say that Jen did sum it all up!!!!!! Pinning this for a weekend meal! I love it and all the variations (didn't use...substituted...added this.) Love those recipes that you can just eyeball. Thank you for gushing, Kim! I am so making this! What an array of wonderful flavors! Lovely! You don't like celery? Seriously? Huh. I love your additions and agree that ginger puts things over the top. This looks amazing; gushably so. I love quinoa almost as much as you:) I see you gushing so this recipe must be over the top:) trust your judgement. I'll have to make quick trip to Costco, because I'm out of quinoa, but I'll be making tehis one soon. Pinning! Hi, do I need a wok to make this? Is that what the recipe describes when it says "large, dry, heavy bottomed skillet?" Currently I just have a standard-sized skillet. I've been wanting to purchase a wok or something similar for stir-frys, but need a recommendation for a good type/brand. Also, does 1.5 cups quinoa mean that's the dry, uncooked amount? Melissa, good question!! I have to admit that I almost always rinse my quinoa. I have been known to skip that step when I'm in a big rush though, and I don't think I've really noticed a difference. Probably best to rinse, as yes, I've read the same as you about the coating. Perhaps different brands have different amounts though, so test with yours!! Can't hurt to rinse though... Let me know what you think of the dish if you make it!!! I made this last night for supper and it was so yummy!! I was surprised at how much flavor it had and how much it resembled regular fried rice! 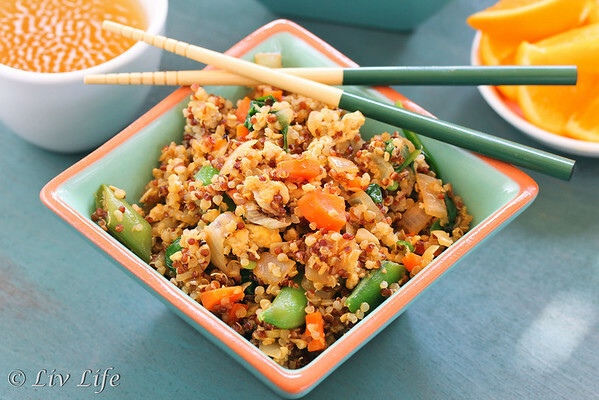 I have been looking for more recipes using quinoa and this one is definitely a keeper!! Thanks so much for sharing! Jen just has an eloquent way with words. I totally agree with here. I have to make this!